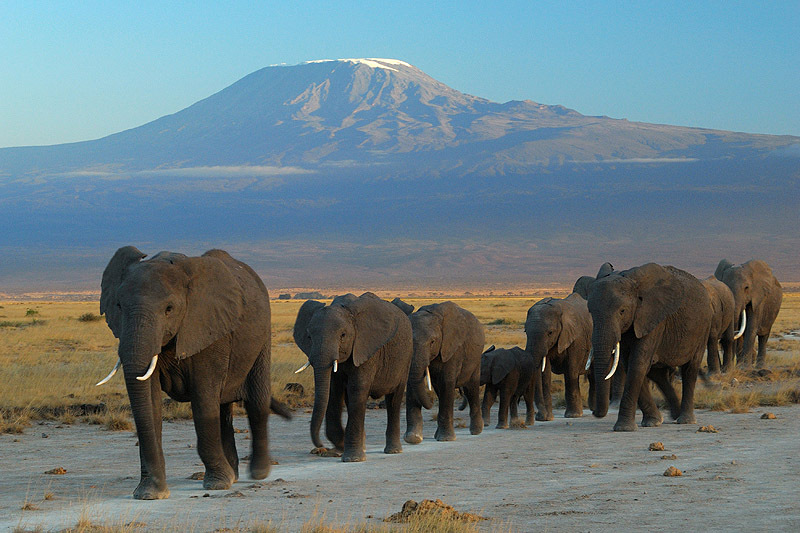 Home to the mighty Mount Kilimanjaro and hundreds of giant big-tusked elephants with spellbinding scenery that can only be described as ‘out of this world’, the Amboseli region will have you feeling as if you back in the time when giants roamed the earth. With its emerald-green, perennial swamps lying like mirrors of glass beneath the brooding shadow and swirling cloud of Mount Kilimanjaro, Amboseli is like an oasis in the dry savannah and one that attracts some of Kenya’s greatest concentrations of game. Herds of magnificent elephant, bloats of hungry hippo and an array of wandering plains game converge on the permanent swamps and lakes to graze and drink and can be viewed against the strikingly beautiful backdrop of Kilimanjaro, an ‘Out of Africa’ scene that is instantly recognizable. Explore this magnificent region with us on a visit to one of the superb national parks in the area, the most famous of which is Amboseli National Park, famed for their incredible elephant population and thousands of resident year-round game. Tucked between the lofty heights of the snow-capped Mount Kenya and the verdant chasms of the Great Rift Valley, the high-lying plains of Laikipia teem with game and offer a breathtakingly beautiful diorama. Incised by north-flowing streams and rivers that wind their way lazily into the great Ewaso Nyiro River, northern Kenya’s most magnificent river, semi-arid plains, dramatic gorges, and acacia-thicket-covered hills create an inimitable terrain that is home to some of Kenya’s highest populations of endangered species. Wild dog, elephant, black rhino and half of the world’s Grevy’s zebras roam across a rugged patchwork of privately owned ranches, wildlife conservancies, and small-scale farms where exclusive and luxurious lodges or tented camps cater for wildlife-lovers and safari fundis. Local Samburu and Ilaikipiak and Mokogodo Maasai communities welcome visitors into their untouched world where conservation is critical and cool, temperate climes offer year-round comfort.